Ride America for Safe Routes is organizing for a fall 2014 tour - the Healthy Active Places Tour! We will be riding across the Central Valley of California, a region with huge needs for Safe Routes. Stay tuned for more details and support the 2014 Tour anytime! All the funds we raise will benefit the Safe Routes to School National Partnership's work to advance safe routes across America. 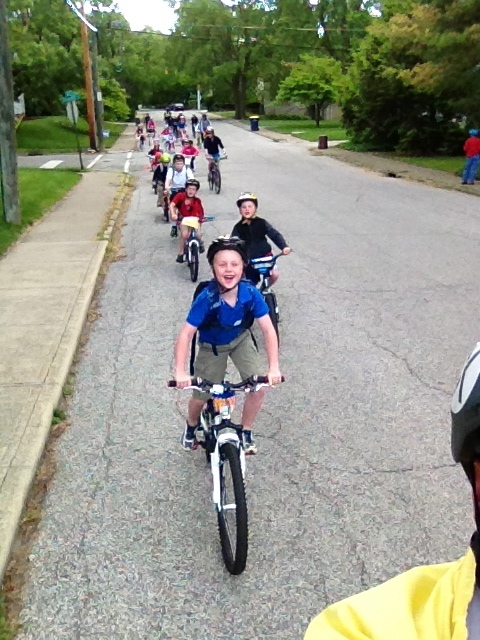 It's been two years since Ride America for Safe Routes bicycled across the country to promote safer streets for bicyclists and to enable children to get a little much-needed activity on the route to school. That trip was life-changing for the whole RASR Team, leading me to land a job that I love on the last day of our trip. That job brought me here to Sacramento to work for the Safe Routes to School National Partnership, advocating for more funding and better policies to support walking and bicycling for transportation in California. Now we're reuniting several members of the RASR team for a sequel - the Healthy Active Places Tour: Central Valley 2014! This time, we're focusing on bigger and better advocacy over a shorter trip. Just as we did last time, we've chosen our route not for scenic vistas or challenging riding conditions but to target our advocacy to an area with really big needs: California's Central Valley. Kicking off in Sacramento on September 28, the Healthy Active Places (HAP) Team of seven women will ride over 300 miles in one week, crisscrossing the Central Valley to finish in Fresno on October 4. Along the tour we will connect with communities through school events and invigorate local efforts to encourage walking and bicycling, in addition to spotlighting the challenges facing residents in this region. High rates of poverty, terrible air quality, lack of access to healthy food (despite producing 25% of the food Americans eat), and poor infrastructure - especially to support safe physical activity - result in alarming rates of obesity, asthma, and related health disparities among children and families in this region. The connections we make with community-based organizations and leaders on the ground will help to strengthen the capacity of the Safe Routes to School National Partnership's network to advocate for the specific needs of Central Valley communities back in the State Capitol. We have school events in the works for each stop along the way, and hope to make a quick detour over the High Sierras into Yosemite Valley mid-trip as a riding bonus (lest anyone worry that we won't ride enough hard miles!). 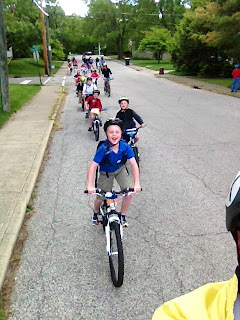 Donate to support healthy active places - The HAP Tour is co-organized through volunteer time and very limited resources by Ride America for Safe Routes and the Safe Routes to School National Partnership. We need your help to make this event successful and effective! Our goal is to raise $6,000 in the next six weeks, and a contribution of any size will help us reach that goal. Funds raised will support the HAP Tour and benefit the Safe Routes to School National Partnership's work nationwide. Follow the HAP Tour and help spread the word! - Follow us on healthyactiveplaces.org. We'll be posting lots of updates as we finalize events and confirm our route. Like us on Facebook and share our project with anyone you know that may be interested! Thank you for supporting a future where all communities can be healthy, active places! The inaugural RASR ride from Key West to San Francisco was one of the most wonderful, amazing, and inspiring experiences of my life. I'm thankful for Jeanie, Chelsea, Stephanie, Darlene, Caitlin, and Hannah who all helped plan the ride, contacting all the warmshowers hosts and other friends who hosted us, rode long miles under all sorts of condition, and willingly fixed meals and flat tires, cheered each other along the way, and took turns driving the Manatee. What a great experience to befriend biking or walking advocates in clubs and city governments along our route. I'm thankful for having the good health and energy to enjoy the ride and become stronger each day as we crossed the country. It was wonderful to take three months to be outdoors, exercising so many hours every day and enjoying seeing so much of our country close up- the good and the not so good. I'm very happy to know there are so many others across the country who are working to make their communities safer and more welcoming to pedestrians and cyclists of all ages. I'm glad we had such a mild winter with mostly great weather for our ride and that we completed our trip safely. It was great to have the support of George Washington University Exercise Science Chairwoman, Dr. Loretta DiPeitro, whose tremendous support made it possible for me to use our active transportation work and report from our ride to complete an internship towards my Masters of Public Health degree. Thanks to all our hosts and donors of funds or bike support who helped make this possible. Thanks to all the school staff and the kids who were excited about cycling. Thanks to Steve who supported us all the way on this project and for most of the trip stayed at the home front, taking care of our pets and working to pay our bills! Most of all, I'm so glad to have had three months on a mission with two of our daughters, and many wonderful friends! What an amazing year. Truly, I feel so blessed! A year ago I was dreaming up this idea to bike across the country, knowing it would be a powerful experience, and hoping it would help me realize some of the big dreams in my life. My wishes came true and so much more... riding across the country for safe routes turned out to be a more amazing experience than I could ever have dreamed, and it landed me in a state that is the mecca for all outdoor activities, in a job that I love advocating for safer routes for which I grow more passionate every day! Phew, what a year! Thankful is hardly adequate. Humbled is closer to how I feel. I couldn't be more thankful for every bit of generosity we received on our spring trip from nearly everyone we met, even in the most surprising places (an observatory in the Davis Mtns of West Texas, or a Mexican restaurant in a sleepy town in the middle of Oklahoma are just a couple of the many places that come to mind...)! This country is home to some wonderful people, and there's no better way to meet and befriend them than from the saddle of a bike. Thanks to all of our new (and old!) friends and supporters, we couldn't have done it without you and hope to see you all again on a future tour! Speaking of future tours... we are in the early planning stages for a regional tour next year! Probably late spring, possibly in the northwest, definitely another life-changing experience. Stay tuned, and drop me a line if you're interested in participating! Chelsea returned to Vermont and speed-wrote her geology thesis in two weeks, handing it in on the deadline and graduating from Middlebury College with high marks! She and I spent several weeks traveling to celebrate, visiting friends (and rock climbing and bike riding of course) around New England and then road tripping out west to Montana where she will spend the next year living with friends and teaching Spanish to toddlers. Our trip back across the country included a stop in Naperville to see Steph, a stop at our Grandma's house in Missouri, and a couple of days in Idaho for the Coeur D'Alene Ironman race weekend (we volunteered and signed up for next year!). Again, lots of bike riding and running were mixed in during that trip. Jane returned to DC and also finished up her school semester with last minute work to summarize the physical activity promotion benefits of our trip and present to her department. She hardly slowed down at the end of the semester, picking up several several summer courses almost immediately. Steve and the animals are glad to have her back home in DC, and they've all been busy harvesting a booming crop of vegetables from the backyard garden. Steph is back in Naperville with her family, helping take care of her baby nephew, and doing dirty dashes on the weekend with her dad and sisters (5k obstacle run finishing with a crawl through a mud pit). She took a canoe trip in June in Wisconsin with her boyfriend Greg and a bunch of friends, and she'll spend the rest of the summer working for the Student Conservation Association. She supervises a group of 10 high school students in a conservation work program, including hard labor such as trail building and educational field trips. She'll join Greg in the Alaska wilderness for a few weeks in September and is planning for a another reunion with Jeanie in the fall. I (Jeanie) and the Manatee made our 3rd voyage across the country this year (note: Manatee's odometer recently passed 22,000 miles... since January), dropping Chelsea in Montana before heading to our final destination and new home, Sacramento, CA! After presenting to the Safe Routes to School California Non-Infrastructure Forum here back on April 30, Chelsea, Steph, and I had dinner with Deb Hubsmith, Executive Director of the Safe Routes to School National Partnership and founder of the movement for Safe Routes to School. The timing couldn't have been better - Deb was hiring a new advocacy organizer in California, and recommended I apply. I got the job! Very happily, I've gone from volunteer to professional bike/ped advocate in a matter of weeks. I've been on the job as California Advocacy Organizer for two weeks now and really love it. California is an exciting and dynamic state to work in, and I've already been able to reconnect with many of the great friends we met on our trip. This is also a pivotal time to be working in the active transportation arena, with bad news for bike/ped projects out of Washington and even greater need to galvanize the already strong movement for safer routes. Our honorary teammates and other friends have also returned to their normal but very exciting lives. Darlene is back at home in Georgia, but is expanding her bicycling horizons with a new (fast!) riding partner and lots of big rides in her future. White lightning (her bike) is on vacation with her in Michigan, and they will be embarking together on the grueling Six Gap Century in north Georgia in Sept. Kaitlynn had an adventurous trip back across the country in May, including camping and climbing in Utah and a stop at her alma mater Middlebury College for Chelsea's graduation. She is now in India for a fellowship at an affordable private school in Bangalore. Hannah graduated with Chelsea in May and moved to Jackson Hole, WY to teach at the Teton Science School. Last but certainly not least, Ride America for Safe Routes just this week received approval from the Internal Revenue Service for tax-exempt 501(c)3 status! That's right, we're officially a non-profit! To all of our donors - thank you so much for your support, we couldn't have done it without you. And now you can write off your donation on your 2012 return! We're obviously excited by this big step for our organization, and starting to set our sights on bigger and broader organizational goals and plans for future safe routes advocacy tours. Please stay tuned! And we'll continue to stay in touch with all of our friends and supporters with updates. BIKE MORE! How bike-friendly were all those places we visited? The long-delayed "RASR Ratings" are finally live on our website. We've compiled our impressions of the bike-friendliness of each community and state we encountered during our cross-continental southern-state tour. After several weeks to reflect on and compare them all (and arrange them in a somewhat web-friendly format), we are ready to publish them for the review and interest of our loyal followers. As the disclaimer reads, we by no means conducted a comprehensive survey in each community, but simply made observations as we passed through on a single stretch of road. We intend only to share a bit of feedback from the perspective of a short-term visitor, and ideally to stimulate discussion around changes that might be made in these locations to attract more cyclists. Please take a look, share your feedback, and especially let us know if you think we got it wrong in your area! Near the end of our trip I was contacted by a SRTS advocate in Indianapolis, Jennie Pyrz, to see if by any chance we'd be in Indiana in time for Transportation Secretary Lahood's visit on National Walk to School Day. Unfortunately, though it would have been terrific to meet Mr. Lahood, we were in Santa Cruz that day, Apr 27, preparing for our big finale ride into San Francisco. Fortunately, Indiana is on my way home and the timing worked out perfectly for me to be here on the very first National Bike to School Day! Jennie connected me to a couple of downtown Indy schools and I made arrangements to stay with family of mine in a northern suburb called Noblesville. Bike to School Day, May 9, dawned a cool clear morning and the sun sparkled in the shiny blue paint of my lovely bike as I pulled it out of the van. Now 10 days since our last ride in California, I've been feeling severe long-ride withdrawal, exaggerated by all the driving I've been doing. Stephanie and I took a couple of easy spins in Naperville over the weekend but I was looking forward to a full morning of riding on unknown roads. I rolled out just as the sun was coming up over the cornfields, with time to cruise 20 miles to the first school - Immaculate Heart of Mary K-8 School (IHM) - before 8am morning assembly. My route took me past subdivisions for 10 miles and then hooked up with a rail trail for the remaining half. Not sure what to expect, I had a surprising treat in store for me. Freshly-paved shared-use paths lined the major roads past the subdivisions, and the Monon Trail was a gem - recognized as a rail trail hall of famer! Very few other users were out at that time of the morning so I was in bike heaven as I flew through lush forested parkland and past quaint neighborhoods, restaurants, and coffee shops. Even when I left the Monon at the northern end of downtown the streets were wide and easy to navigate. Who knew? Bike-friendly Indianapolis! 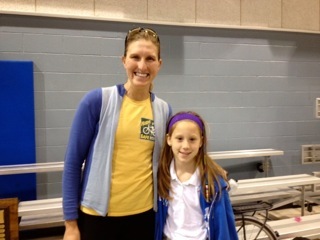 I arrived at IHM with 5 minutes to spare before the school-wide morning assembly, and was met by enthusiastic SRTS parent and champions Hilary Oberlies and Molly Noble. 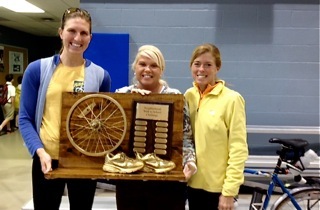 IHM was the winner of the Walk to School Challenge during the month of April between four area schools and was receiving the trophy that day as an award. I helped to present the trophy to Vice-Principal Ronda Schwarz (the Principal was away with the 8th graders on their Washington DC trip), and then spoke briefly to the students about our trip, emphasizing how lucky they were to live in a neighborhood with a community school and to be able to walk or ride their bikes to school. The other school on my schedule was right across the street from IHM. Public School 84, also known as the Center for Inquiry - a very formal title for a beautiful community K-8 magnet school - was making a big deal out of the very first annual National Bike to School Day. Kathy Whited was the SRTS champion that organized bike decorating parties and several bike trains to maximize student participation. I rode a few blocks away from the school to join a bike train back to school and had a chance to speak to some of the parents. 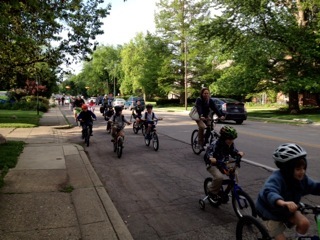 Once the third bike train had arrived we counted nearly 90 students that had ridden their bikes to school. Both bike racks were jammed and the handicapped ramp railing served as overflow locking space. Very impressive participation, and kudos to Kathy for her great organizing and parent-recruiting work! I again spoke briefly during the morning assembly and though I hadn't been allotted time to answer questions, hands were shooting up anyway around the gym while I talked. I had breakfast with Kathy and her husband Kevin, executive director of the local bike advocacy group INDYCOG, following the assembly at CFI, and was able to hear more about what's happening in Indianapolis for bicycling. I really was impressed by the bike friendliness of the parts of the city I experienced, and I hope to have another chance to come back and ride in the area. Thanks Kathy and Kevin for allowing me to participate in your National Bike to School Day events, and for making me feel so welcome in the city! It was especially lucky that my visit to the Indianapolis area and to my Aunt Debra's house coincided with a visit by her mom, my Great Aunt Charlene, who had already played host to our whole team in the Phoenix area. Debra and Charlene treated me like a queen, spoiling me with all the ice cream I could eat, dinner out, and kingly sleeping arrangements. It was very nice to see them - thank you to both of them for a really wonderful visit! After you've been riding a bike every day for three months it's a strange feeling to stop, and even after a week I don't think it's quite sunk in that the great cross country tour is over. Maybe that's partly because I'm still on the road, traveling back east this time. I imagine when I stop moving it will catch up with me. Better keep moving! Sunday after the big finale we enjoyed a beautiful day of sightseeing in San Francisco. We had a delicious brunch with my friend Diga and wandered around her neighborhood, which is adjacent to the Presidio, the dramatic Palace of Fine Arts, and the bay. The notorious San Francisco fog was nestled in around the Golden Gate Bridge, and we were grateful for the clear weather that graced our trip over the bridge. We continued our eating tour of San Francisco with Matt and Brian, our bike-shuttling heroes of the previous evening, at a Burmese restaurant called Mandalay. Brian ordered up a delicious variety of dishes for us to sample family style around the table. Thanks to Matt and Brian for showing us some of the highlights of San Francisco, inviting us for a terrific lunch and again for shuttling us over the GGB to Sausalito (and our bikes back!). Sunday afternoon was occupied by our usual day-off tasks - laundry, organizing, and cleaning the Manatee - only this time we were separating out each rider's personal belongings, packing bikes for Darlene and Kaitlynn to fly home, and giving the van it's final big clean-out for the road trip home. Jean Hayward and her husband Jim's home in Oakland was the site of this unpacking/repacking chaos, where we had adequate space to spread out on the sidewalk and backyard, and follow up our hard work with a satisfying home-cooked meal and tasty variety of ice cream choices! Once bikes were boxed and suitcases packed, it really set in that we weren't getting up to ride another day on Monday. We still enjoyed a last relaxing evening together, some lively conversation with Jean and Jim, and settled in around their house for a restful night's sleep. Thanks to Jean and Jim for exceeding our (now quite high!) standards for hosts and for graciously allowing us to take over your home! Monday morning Jeanie and Steve got an early start to whisk Darlene off to the airport for her flight home. Even in my pre-dawn haze I was sad to bid farewell to our most dedicated and outgoing of honorary team members. Between her guest appearance for 10 days in Georgia and her week with us in California, Darlene had truly inspired us with her enthusiasm for cycling and for life, and with her carpe diem decisions to twice take a break from her busy life as a business owner, mom, and wife to join us. The consolation of saying goodbye to Darlene is knowing that we'll surely see her again sometime soon - probably on our next tour! We love you Pink! Jane and Jeanie spent late morning on Monday at the exercise physiology lab at San Francisco State University, getting post-ride testing done to compare to our pre-trip VO2 max and body comp data. Jane will be using the data for her trip analysis and summary report for her Master's of Public Health program back in DC. Jeanie's results from the post-trip testing were a bit ambiguous (showing no change in fitness but possibly skewed by sleep deprivation for the pre-dawn airport trip), but Jane's results were very impressive, with a big jump in VO2 max on the bicycle ergometer. I think it's safe to conclude that biking across the country is good for you! We left Kaitlynn in San Francisco for her Tuesday flight with our new buddy Brian serving as host and tour guide. She got a tandem tour of the city - lucky girl! Kaitlynn had also become a very special honorary RASR rider after two weeks with us, impressing us with her hard work and ability to jump in with us at the end and more than keep up with our long days and many difficult road conditions. She also cheerily took on the team tasks of driving the Manatee, setting up camp, cleaning, etc, and always boosted the team morale with her chipper outlook. We even threw her in on her first day for the challenging work of directing hassled Tour de Mesa riders to our table at the ride expo, a role that she embraced and quickly mastered. Her ability to brag about our accomplishments soon became a major asset to us, especially on our evening out in San Francisco! Our goodbyes with Kaitlynn were slightly less emotional, only because most of us will be seeing her again very soon at Chelsea's graduation at the end of the month. Monday afternoon Jeanie, Chelsea, and Steph packed up for the road trip back east. First stop: Sacramento for a short presentation at the California Safe Routes to School Forum at the state Department of Public Health. It was a great coincidence that the Forum was happening on that day, and that we were able to coordinate with Victoria Custodio, Project Coordinator at the Safe Routes to School Technical Assistance Resource Center, to be surprise guests at the end of the Forum. Even more exciting, our presentation followed the keynote address by the Safe Routes to School National Partnership's Founder and Executive Director, Deb Hubsmith, and we arrived at the Forum just in time to hear her talk. After volunteering and fundraising for SRTSNP for three months it was an exciting and appropriate end to the trip to hear Deb's presentation and meet her, and then to give our own trip summary presentation to a room full of hard-working SRTS champions. Thank you to Victoria for inviting us to the Forum, and to all of the California SRTS coordinators for the warm reception and for the great work that you do! We were also very appreciative to have some one-on-one time with Deb after the Forum. Our timing worked out to have dinner together to learn more about the work of the SRTSNP and share more stories from our trip. Thanks Deb for a terrific dinner! After dinner we had a few minutes to grab fro-yo and catch up with my friend Dom before we got back on the road to make Nevada in time for bed. Our two weeks in California seemed much longer with all of the places we visited and the incredible memories made. It was definitely the perfect place to finish our trip and treated us very, very well. Though it was hard to leave the state and turn eastward, we all had a feeling we'd be back soon! From Sacramento we had four days to get to Stephanie's home in Naperville, IL for Chelsea's flight back to Vermont and Stephanie's sister's college graduation on Saturday. We veered slightly out of our way to spend a day in Missoula, MT with Chelsea's man Brett, but managed a whirlwind tour of some dramatically beautiful parts of Nevada, Idaho, Montana, North Dakota, Minnesota, and Wisconsin. We covered about 2,600 miles in four days and traveled backwards and forwards through the seasons along the way. It's odd to cover half the miles that it took us 3 months to travel in one-twentieth of the time without moving our legs at all! We made it safely to Naperville to a happy reunion with Steph's family and faithful pup Autumn, and put Chels on her plane back to Vermont. I still have a few miles ahead to get back to DC, including a stop in Indianapolis for a school speaking tour on National Bike to School Day, and a visit to my Grandma in Missouri. To our dedicated readers: thank you for following us on this journey and stay tuned! There will be more to come. Wrapping up. More travels. Heading back to school. Graduation. New jobs. And planning for another tour! Friday was an early morning wakeup in Veterans Memorial State Park high on the hill overlooking downtown Monterey. The day’s itinerary had us riding a mere 45 miles into Santa Cruz for a presentation and lunch with a consulting group called Ecology Action and then a free afternoon to enjoy the beach and bike-friendly glory of Santa Cruz. We rolled up camp and saddled up by 7am for a breezy downhill start. The weather was clear and a bit chilly but generally perfect riding weather. In downtown Monterey we picked up the Monterey Bay Coastal Trail which followed the coast halfway to Santa Cruz. The trail was packed with riders commuting and training in giant peletons. This was a new experience for us to encounter busy bicycle traffic and made the otherwise peaceful path much more exciting! The path ended in California’s strawberry belt, and the rest of the day’s ride took us on farm roads through fields bursting with giant ripe red strawberries and artichokes. A few more miles of riding past sleepy beach towns and we knew we’d arrived in Santa Cruz when bike lanes and cyclists were visible on every street. But truly the best stop in Santa Cruz was the home of Joan Leitner and Steve Elston in the sister town of Capitola. If you’re a loyal reader of this blog you’ll remember Joan and Steve from our overnight in their airplane hanger in Pahrump, NV. After our second night with them they were unanimously our favorite hosts of the trip. Joan and Steve have created an urban oasis on a compact lot a few blocks from the beach, complete with a beautiful home, spacious patio, hot tub/sauna/outdoor shower, “bike cave” with a full shop and at least ten bikes hanging (where five of us girls slept), and lush garden. Our evening at the bike oasis just kept getting better after we arrived – we toasted a few Fat Tires, hit the hot tub, settled down on the patio for salad, grilled artichokes, and sweet potatoes, and then a creative variety of crispy pizzas began emerging from the wood-fired oven. Greg McPheeters of the Silicon Valley Bike Coalition (and a few other bike coalitions) joined us for dinner and shared some local bike news and stories with us. Joan and Steve kept the pizzas coming until we were stuffed, and we topped it all off with some delicious chocolate from Greg. As the night wore on we were reunited with the team dad and husband Steve, who arrived with Jane’s great friend from grad school, Jean Hayward. With the whole finale gang finally present we had a short briefing on the next day before settling in for the night. What a terrific evening – no better way to spend our last night together before the big finale ride! Joan and Steve and PIZZA! New tunnels will make riding this section easier! Our friend Peter from Miami and his local friend Brian picked up with us right before we stopped for lunch, in the midst of the worst section of road, so we could finally relax and catch up with him when we stopped for lunch. It was really incredible to have so many people with us at the end, and especially folks that had been with us so early on! After a quick bite in Pacifica we continued up the coast and started to hit south San Francisco neighborhoods. We knew we were in the city when we hit our first real "San Francisco hill". A right turn on Skyline Dr had us heading uphill at a steep grade, with each bend in the road it seemed to get steeper. We crested the hill after about a mile at 15% grade and got our first glimpse of the city skyline and the top of the Golden Gate Bridge! With a rare clear, sunny, and warm day in San Francisco the city was packed, and when we turned away from the coast into Golden Gate park we met a new challenge - dodging the weekend crowds. We were so thrilled to be in the city that we just soaked it all in and enjoyed the sights. We weaved our way down to the bay and met three local bike advocates - Dave Snyder, Executive Director of the California Bike Coalition, and Matt Dove and Brian, Program Director and Educators for the Presidio YMCA's YBike Program. The guys led us for our final 2 official miles of our cross country journey to Crissy Field and the Golden Gate Bridge! It was an emotional finish after more than 5,000 miles to arrive at our final destination, and felt almost surreal to be at the end of the road. The moment was made particularly special by the presence of Darlene, Steve, Kaitlynn, Jean, and Peter. The spirit of all of our honorary team members and new friends were with us on Crissy Field, and made our trip truly memorable and meaningful to us. Thank you to everyone that rode with us, hosted us, fed us, coordinated events for us, and gave us valuable advice along the way. You are all very special to us! The ferry ride was beautiful and finally gave us a chance to sit and relax. When we arrived city-side again sans bikes we had to hobble in our bike cleats along the Embarcadero about a mile to Pier 23. Again, two gentlemen came to our rescue, this time in pedi-cabs. We hopped in and relished a mile of riding with someone else doing the pedaling. Pier 23 was a great spot for our final dinner with lots of new friends and a few old ones - Jane's friends Patti and Jill from grad school at Berkeley in the 1970's were even able to join us! Dave Snyder had also invited some of his bike enthusiast friends who shared in the celebration. We enjoyed excellent seafood and drinks and toasted to an amazing final day. And last but by no means least, (as if the day couldn't get any better!) the girls capped off the evening with a night out with some of my very best friends from college who all now live in the Bay Area. We stayed with Diga, another incredibly gracious hostess, in her beautiful apartment near the Presidio, and had a chance to catch up with Sonia, Julie, and Dom, who I hadn't seen in almost eight years! So wonderful to see them all and hear the latest on their busy and very successful lives. We hit a few local establishments and cut loose on the dance floor, knowing we didn't have to save our legs for another day of riding. A great night, an incredible day, and a life-changing trip. Thank you to all who were a part of it!! Reunion with my beautiful Brown Water Polo teammates!